Suburban Landscaping has been a leader in drainage work in the Chicago south suburbs and Northwest Indiana for over two decades, and continues that tradition with unique and inventive drainage solutions for both small and large projects. Having a myriad of different products and techniques available to our drainage designers, we custom design strategic drainage systems to fit your property and needs. Our drainage designers strive to provide you with visibly pleasing, permanent solutions to your drainage problems in a cost effective manner. We are familiar with storm water laws and most local municipalities regulations regarding retention ponds and storm water drainage. All of our products are made from commercial grade materials and many have a lifetime warranty. Our expertise covers far beyond the common residential drainage problems such as flooding, standing water, storm water run-off, and soggy lawns. We also specialize in larger projects such as retention ponds, culverts, and negative grade problems. Drainage issues are often more than just a potential hazard, they often can be harmful to your landscape as well. Proper drainage is important to your lawn and landscape as is proper irrigation. Standing water near plants or in your lawn can cause lawn disease and root disease in many common plants. Some plants and trees can even be killed by excess standing water. Poly corrugated drain tile is the industry standard in relocating, distributing, and collecting water. These flexible poly pipes are durable, and adaptable to most situations. Often used in leach fields, perforated tiles can percolate water back into surround soils, providing re-absorption is the desired goal. These tiles are very flexible in construction and in design, therefore becoming the most used item in drainage solutions. 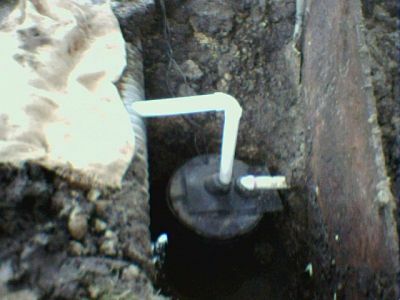 Down spouts are a necessity for all homes & buildings, but their use can cause large amounts of water to be collected in small areas, usually near the concrete foundations.By connecting down spouts to a drainage system, the water can be relocated to a more suitable area or to and lawn area to be reabsorbed far from the foundation. These simple looking installations are very valuable tools in landscape drainage, but they do require some thought before installation. Pipe size, clean-out pipe, catch basin, air gap, connectors and water volume and velocity are all factors that would be considered before the installation process begins. A swale is a natural grass area designed to channel water from one area to another, much like a creek or stream, except they're usually dry. A culvert is a similar device, but often used under driveways or along roads. Culverts usually contain a large pipe and inlet or catch basins. Named after and American farmer, a french drain system is a multi-functional system that can drain water away from unwanted collection areas and relocate the water in suitable areas. A french drain can also act as a storage location for water until the water has had time to absorb back into the ground in approved areas. 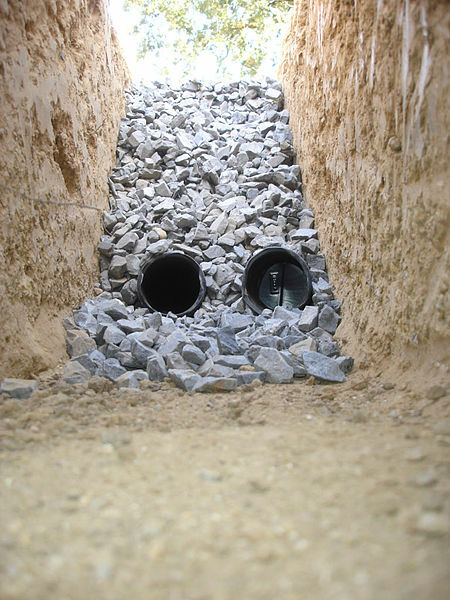 A french drain is usually a gravel filled trench with a perforated pipe in the center. The pipe, pitched at one degree or more, will allow water in and out of it, through the gravel, to be reabsorbed by the surrounding soil. A french drain can also be used as a collection are for other draining systems. The simplest form of re-directing water is usually done by regrading the topography of the existing land. Using heavy equipment, we can often transform the existing direction of water flow with permanent results. Re-grading is a standard in most drainage solutions and often the best solution where applicable. When re-grading, always remember to calculate these simple factors into your equation: location of re-located water, pitch of grade, "walk-ability" of grade, erosion, and soil stabilization after grading. Sometimes there is a need for a collection area for water storage and re-absorption, this is where a dry well can come in handy. Modern dry wells use a poly shell to allow water in quickly and then slowly release it for re-absorption into the surrounding soils. Often used in conjunction with drainage systems, the dry well can play a major role in resolving drainage when other systems are not applicable. Even though dry wells are an excellent option, there are limitations to their use. Soil absorbtion rates and percolation rates are important factors in the size and materials used in dry well construction. Soil types also can factor into the construction design of dry wells in drainage. Although drywell kits are sold at local home improvement stores, we do not suggest trying this installation yourself. As easy as it might seem, there is a complicated amount of math and formulas that are involved in the propper sizing and material choices. A DIY tip for drywells is always install an "over-flow" outlet. 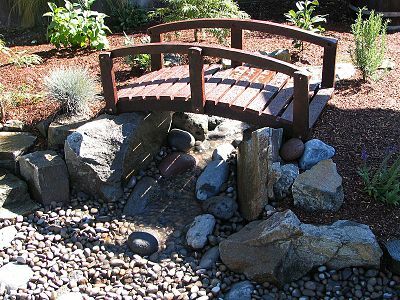 Dry creek beds are an aesthetically pleasing way to control watter run-off and drainage issues in high visibility areas, while adding natural beauty to the landscape. Constructed with a wide variety of materials, dry creek beds can be blended into any type of landscape or design with ease. A dry creek bed can be used as a overflow system or a primary system depending upon your particular conditions. Our systems of last resort are always mechanical devices. We highly recommend the use of natural drainage systems or systems without mechanical parts for long term solutions. Sump pumps and other mechanical devices used as primary devices to relocate water can be problematic. Mechanical devices to relocated water will eventually fail, it's just a matter of how often you use them. Also, electrical devices such as sump pumps use electricity every time they are needed, adding an ongoing maintenance cost to their installation cost. Flooding driveways can usually be fixed using one of the items listed above, however, sometimes they require special drains in the concrete or asphalt. 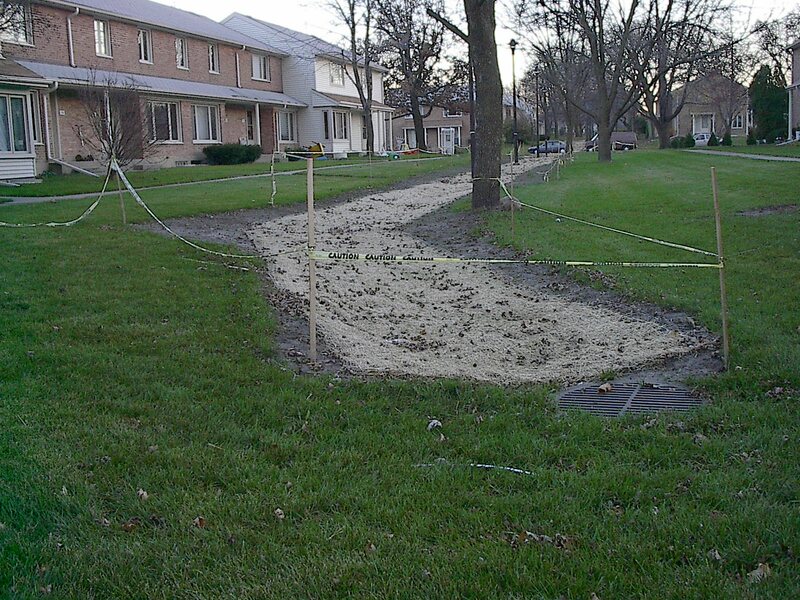 Channel drains are one method of driveways drainage that can alleviate a flooding driveway. A channel drain cut into the driveway to catch running water or drain standing water usually connects to a drain tile system that drains the water to an acceptable location. Drainage solutions vary greatly in cost, mainly due to the many different types of drainage situations and solutions that exist. There also is a wide variety of products and equipment required in drainage work that change depending upon our situation. Costs may also be less if combined with other work such as landscape installation, retaining walls, or a brick patio. For example, gutter drains (down spouts) may be dumping water along your foundation, which could be remedied by adding a drain tile to your down spout and moving the water further from the house. This solution may cost as little a $150 per down spout. Another solution could be to add soil along the foundation wall to create "positive pitch" away fro the house, but only if you have enough exposed foundation to do so. This may cost over $500. Yet another solution may be an underground collection pit to collect the down spout rain water and store it for re-absorption into the surrounding soil. This may cost over $750. In this same scenario, there are more drastic measures available as well, such as mechanical pumps to relocate the water over higher ground, costing over $1,000. So, as you see, there are a myriad of solutions for each drainage problem, and different costs for each. 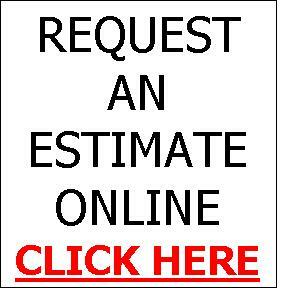 Our drainage experts can help you with all of them, all you need to do is request a quote. As an example of a probable cost to each type of solution, we have listed some prices below for each type of drainage solution. Please remember, these are just examples. Down spout discharge run into the lawn: $95 - $200 per down spout, depending upon length of run, type of pipe needed, soil type, and other factors. 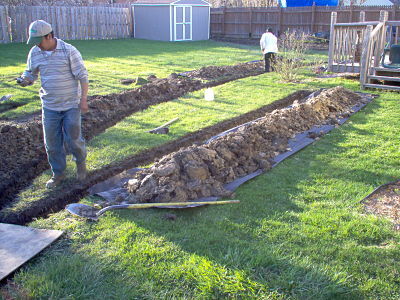 Dry well or French drain to fix a soggy lawn: $900 - $5,000. Many, many factors and calculations are involved with this work, such as quantity of water, soil type, topography, and application. Re-grading of a lawn area to relocate standing water: $1,500 - $7,000. Price is based upon many factors including size of lawn area, topography, removal of existing turf, and re-sodding. Pumps to mechanically move water to another area: $1,800 - $3,000 depending upon pump size, connections needed, electricity source location, pipe size and type, and location of water disbursement. Again, there are many, many variables involved in drainage work, so prices can differ greatly depending upon your existing situation. However, be assured, that we can solve every drainage situation, including yours. We do not recommend this option in any form, however, we do understand that the cost of solving a landscape drainage issue is expensive. Often people suffer with flooded basements and crawl spaces because a plumber wanted $20,000 or more to fix the problem. If your sink leaks, we cannot help you, you need to call a plumber. But, if you are getting water IN your house that is coming from the OUTSIDE of your home, call us instead of a plumber. We often hear that we make drainage look so simple when we are installing the solution to your water problems. It may look simple to many, especially the handy folks, but it is not the shovel, trencher, or backhoe that is the difficult part, the difficult part is the mathematics and knowledge of drainage, soil types, topography, and even some engineering that is required to formulate the correct solution. Some of the materials we use (schedule 40 pipe, DWS pipe, sump pumps) are available to the public at retail prices through places like Home Depot. We realize that you can pay for tools and materials for your residential drainage project, but if they are installed in-correctly, you have wasted money and could possibly cause a bigger problem then you started with. Most physically fit people could dig a french drain trench, but only an expert can determine the trench height, width, and length. You also need to know the gravel type, drain fabric AOS, pipe type and size, re-absorption rates, soil types, level of compaction, gallons of water to be dealt with, and many, many other factors to have the french drain work properly. In summary, down spouts may be a do-it-yourself project, but complex drainage is not. If cost is an issue, please see our page on financing or call us to design the project for you. We generally charge between $500 - $800 to design a residential drainage project. Servicing South Chicago Suburbs In Illinois:Alsip, Beecher, Calumet City, Chicago Heights, Country Club Hills, Crestwood, Crete, Dalton, East Hazel Crest, Flossmoor, Frankfort, Glenwood, Hazel Crest, Homewood, Homer Glen, Lansing, Lynwood, Matteson, Midlothian, Mokena, Monee, New Lenox, Oak Forest, Olympia Fields, Orland Hills, Orland Park, Palos Heights, Palos Hills, Palos Park, Park Forest, Peotone, South Holland, Steger, Thornton, Tinley Park, and surrounding areas. Servicing Northwest Indiana: Cedar Lake, Crown Point, Dyer, Griffith, Hammond, Highland, Hobart, Lakes Of The Four Seasons, Lowell, Merrillville, Munster, Portage, Schererville, St. John, Valparaiso, and surrounding areas. We just wanted to say thank you for your wonderful work this winter. Your workers do wonderful work in horrible conditions. Thank you.